The CIO-ERB is a family of electromechanical relay racks designed to be compatible with the CIO-DIO family of digital I/O plug-in boards. There are three models in the family: the CIO-ERB48 contains 48 relays, the CIO-ERB24 contains 24 relays and the CIO-ERB08 contains 8 relays. All relays are form C electromechanical capable of handling 6 A at 24 Vdc or 3 A at 120 Vac. Field wiring is accom-plished using screw terminals for each relay. The screw terminals allow you to connect signals via 12-22 AWG wire. 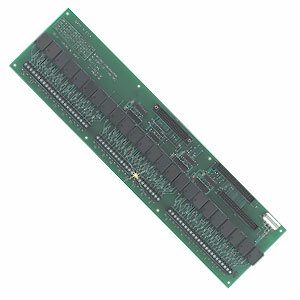 The digital I/O board connects to the CIO-ERB racks via a standard 37 conductor cable, or 50 conductor cable depending on the CIO-ERB model. 참고: All CIO-ERB boards include a 3 m (10') power adapter cable.